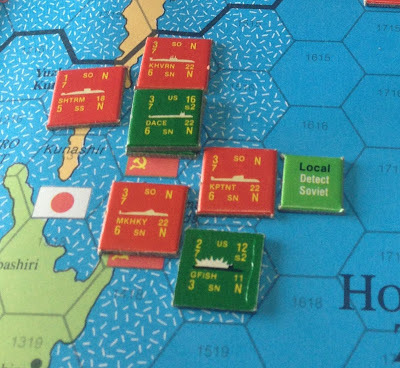 Turn 4 begins and the clock is ticking down on the American submarines in their attempt to break through to the Soviet bastion north of Hokkaido. The scenario is over at the end of this turn and the US has incurred serious losses. So far, the Americans have one submarine lost (Bremerton) and two damaged (Silversides and Guardfish) so the heavy work is left to the two remaining fully operational US subs (the Dace and the Springfield). As day 2 of the battle dawns, both sides put their air units to work. The Americans place all of their P3 Orions on tactical coordination missions while the Soviets do the same. Both sides have already detected the nearby enemy submarines. The USSR starts off the turn with no less than 4 submarines sitting adjacent to the American subs. The Dace and the Springfield are stacked together in the Soviet close defense hex, desperately fighting a close range battle on all sides. The Guardfish, meanwhile, is damaged but not completely out of the fight. In the first two turns of this scenario, the US submarines began their approach towards the Kurile Islands in hopes of breaking through the Soviet submarine defense perimeter. The Americans are trying desperately to get submarines into the Soviet bastion zone in the Sea of Okhtosk. In turn 2, the Soviets successfully sunk one of the US submarines (the Bremerton) as it made a mad dash for the Kuriles. Things heat up considerably in turn 3. The Americans win initiative again this turn and decide to send their three southernmost submarines at full speed towards the Soviet perimeter in hopes of getting through unscathed. The USS Guardfish moves northwest at full speed and is immediately detected by the Soviets. As it enters the Soviet close defense hex near the tip of Hokkaido, it comes under attack and is damaged. At the end of the previous turn, the American submarines were moving towards the Soviet Bastion near the Kurile Islands north of Japan. One group of 3 US subs (Springfield, Dace, and Guardfish) inched towards the southern Kuriles while 2 other US subs (Bremerton and Silversides) had moved further north. Initiative is rolled and the US player goes first. The Guardfish, Springfield, and Dace move slowly up towards the Soviet submarines to the south, hoping to speed through the well-defended zone in subsequent turns. As of now, none of the US subs has been detected. Up to the north, the Bremerton makes a run to the west- straight for the Kuriles. Since the Bremerton is running at full speed and it's within 5 hexes of enemy units and/or a close defense hex, it is automatically detected. The Silversides moves slowly up towards the north, hoping that the Soviet subs will ignore it long enough to make a run for the Kurile entrance next turn. Victory Games followed up 6th Fleet, their successful opening to the Fleet series, with 2nd Fleet in 1986. Featuring war in the North Atlantic between NATO and the Soviets, the game is still seen as a classic among modern naval wargamers. But the best was yet to come. In 1987, the third installment, 7th Fleet, series was released. This game ambitiously took on the subject of naval warfare in the Far East. A massive 3 map effort, the game covers a huge swath of territory that runs along the Pacific coastline from the northern Soviet Kamchatka peninsula all the way down to northern Vietnam. Like the previous installments, the game slowly builds up the player towards mastery of the rules system through carefully planned scenarios from minor skirmishes all the way to World War III. The result is somewhere near a masterpiece full of tense battles between Cold War navies, including Japan, Vietnam, North and South Korea, China, and, of course - the United States and the Soviets.